28 Jan 2019 --- It was Ruby Sunday on the first day of ISM 2019 in Cologne, Germany, as the “fourth type of chocolate” was given its first moment in the major trade show spotlight at the world’s leading sweets and snacks fair yesterday. Just over one year after Nestlé debuted their KitKat Ruby in Japan and South Korea, at least eleven chocolate manufacturers are presenting new ruby chocolate products, from hollows to pralines, at the event. The next major launch using this chocolate innovation will also be from Nestlé, expected in Q1 of this year, under the Les Recettes L’Atelier brand in a tablet form in Europe, including France, Sofia Popova, Director Marketing EMEA at Barry Callebaut confirmed. “They see the benefits and all the media attention that ruby chocolate attracts to the brand. Next to that they see the consumer interest and how well as an innovation it has performed. Nestlé will continue talking about the ruby brand and sharing this story in the new launch,” she tells FoodIngredientsFirst. Click to EnlargeSofia Popova, Director Marketing EMEA at Barry CallebautBarry Callebaut unveiled ruby in Shanghai in 2017, after more than ten years of development. Since its launch, this new variety has been introduced in Asia Pacific, Europe, the Middle East and South Africa by both consumer and artisanal brands, including Prestat, Baci Perugina, KitKat, Leonidas and Fazer. This new type of chocolate is made using the ruby bean. A unique processing method by Barry Callebaut unlocks the flavor and color tone that are naturally present in the bean. The taste experience is described as an intense sensorial delight – a tension between berry-fruitiness and luscious smoothness. Barry Callebaut is now upscaling production at its Weeze manufacturing facility in Belgium. “We now require sizeable volumes so it makes sense for us to invest in production,” says Popova. “It is a balance of production capacity and bean availability and every year we are reviewing demand. But we are planning for an upscale as we see more and more brands are looking for this,” she notes. Popova stresses that ruby chocolate is not based on a specific botanical variety. Rather, the focus is on a single one of the some 20,000 compounds that a cocoa bean contains. “The bean we use is just one that we know is richer in a specific molecule than others. This bean can be found in Brazil, Ecuador and Ivory Coast. Where it can be found depends on the humidity, sunlight and the conditions,” she explains. Nestlé was given a first mover advantage when ruby was initially announced some 18 months ago, as Barry Callebaut needed time to scale the new chocolate. “When we introduced ruby a year ago, we had unlocked the recipe and knew how to industrially produce it, but in terms of live scale industrial capability, we were not there yet. We knew that it takes a brand 6-18 months to allow for that,” Popova explains. Incredibly, Nestlé was able to commercially introduce the first version of KitKat Ruby in Asia just 5-6 months after Barry Callebaut’s reveal, with the product debuting in small South Korean and Japanese patisserie shops on January 18, 2018. At the time, Popova notes it was being produced almost semi-manually between Belgium and Asia. Click to EnlargeLily Libeert, Marketing Manager, Libeert“A quarter later we were able to go for a bigger launch in mainstream KitKat in the Netherlands, UK, Belgium and Germany in April-May 2018. What was important for that launch was how it was introduced really as something special compared to the rest. They unlocked a new price point and attracted a new consumer group,” she notes. “So that worked very well and trial rates in the supermarket were recognized. A quarter later they rolled it out to another brand Baci Perugina (Italy). There they launched in September. Because it is such an iconic praline brand in Italy, we immediately saw other brands launching ruby products in Italy too,” she adds. With annual sales of about CHF 6.9 billion (€6.0 billion/US$7.1 billion) in the fiscal year 2017/18, the Zurich-based Barry Callebaut Group is the world’s leading manufacturer of high-quality chocolate and cocoa products – from sourcing and processing of cocoa beans to producing chocolates, including chocolate fillings, decorations and compounds. The Group has about 60 production facilities worldwide and employs a diverse and dedicated global workforce of more than 11,500 people. During the four-day ISM 2019 program, which started yesterday, chefs from around the world such as Martin Diez, Dinara Kasko, Nina Tarasova and Melissa Coppel, among others, are giving workshops and showcase ruby signature creations in confectionery, drinks, bakery, dairy and desserts. 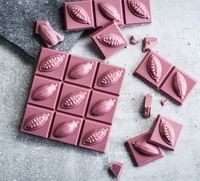 On the manufacturing front at ISM 2019, Libeert, Heilemann, Martinez, Cafe Tasse, Noi Sirius, Hug Wernli, Limar, Minor, Confetti Matrix, Witor’s, Läckerli Huus and more brands (at least eleven in total) are launching their ruby chocolate products. Libeert, for example, presented a chocolate gifting box for “precious moments,” which has now been rolled out in Belgium, Germany and the Netherlands. “Barry Callebaut selected different partners and we were selected for a hollow chocolate,” Lily Libeert, Marketing Manager at the fourth-generation Belgian company (turnover €30 million) Libeert says. “So with our design team looked to develop what would be the ideal shape for a ruby chocolate. Eventually, we settled on the shape of the ruby itself. There are four stripes on the hollow to subtly indicate that it is the fourth chocolate. We did not add anything so consumers can just taste it the way it is. They should just put away any expectations they have of chocolate because it is very fresh with berry notes,” she adds. Click to EnlargeLibeert explained that Barry Callebaut supported them in several tests conducted with the chocolate, as there are issues to keep in mind when working with ruby chocolate, so that the color is not impacted. “We present our product in an all paper packaging and we did not go for a transparent packaging. As it has a natural color it would disappear and become grayer in the light. Oxygen influences the taste and color of the chocolate. So, we made sure it was in a high end box to conserve and protect the chocolate,” she notes. Popova at Barry Callebaut admits that there are some application restrictions at this stage too, such as in bakery fillings. At the moment, Pain au Ruby Chocolat is therefore not possible, for example. “In bakery, we know that it works well in biscuits. But putting it inside a bakery item and then baking it doesn’t work. It is a natural product and does not contain artificial coloring, so from that perspective the color will go away. You can bake it, but it won’t be the same color. It will be a milkier and grayer color and not attractive enough. But you could do a nice filling such as raspberry in a Pain au Chocolat and then add some sprinkles on top, which makes a nice experience,” she notes, for example. Flavor pairing is one of the things that the company is highlighting at ISM 2019, with a wide selection of innovative options on display. “In the chocolate world, it really is a new flavor where you have somewhat of a sour note,” Popova explains. “What pairs very nicely is coconut and raspberry. When paired together with ruby you have a fruity note that is reinforced by the raspberry and next to that you have coconut which is reinforcing the new key note. Things like exotic yuzu pairs well with the citrusy note, for example,” she adds. Consumer testing found that the product appeals across demographics, and not just women. “For the color, it does potentially appeal more to women. But when we tested it on the general population we saw that both men and women liked it, regardless of age,” she says. “From a product perspective you don’t need to learn to like it. We first explained what it was and then they were able to taste it. They liked it even significantly more when tasted. Repeat purchase is also likely to be there,” she claims. Beyond the obvious attraction of the pink color of the chocolate itself, the product concept meets the 2019 trend of the “Adventurous Consumer” who is on a search for discovery in NPD. “But there are a lot of consumers who were teased by the story of ‘being made from the ruby bean.’ I think there is a long way to go before everyone in the world knows that it is made from a ruby bean and is not just pink,” she notes, adding that Barry Callebaut is therefore encouraging manufacturers to tell the story. So there is still a long way to go before ruby truly gets into anywhere near the realm of milk, dark and white, as truly “the fourth chocolate” Popova admits. “If you step outside of the fair it is not there yet. It is still very small and you need a lot of local brands to really nurture it. In the market it is still very small, but it takes time for it to grow,” she concludes. A video interview with Sofia Popova which discusses the market adoption of ruby chocolate can be found here.